Australia’s Civil Aviation Safety Authority has given Google’s Alphabet the green light to start operating their drone delivery company, Wing, within Canberra, Australia. Through partnerships with local businesses, Wing will deliver items like coffee orders or drug prescriptions to people’s homes within minutes. Wing’s new project is likely the first commercial drone delivery service ever. If drone delivery takes off, “same day” delivery might soon seem like a eternity. The new service will first be available to just a limited set of homes around the suburbs of Crace, Palmerston, and Franklin (“Around 100 homes,” according to a Verge report), but will expand to include Harrison and Gungahlin within months. Wing began life in 2012 as a secret “moonshot” project at Google’s R&D facility, Google X, and eventually expanded into its own Google subsidiary in July 2018. Tests during its early years took place in Australia, and that long relationship might explain why Wing is launching its biggest trial run yet in the land down under. The Canberra project was in its pilot stage for the past 18 months, so Wing already has 3,000 deliveries under its belt. Other companies have taken a crack at drone deliveries in the past. Autonomous drone company Flytrex teamed up with the Iceland-based online marketplace AHA in 2017 to launch a delivery service covering Iceland’s big startup city, Reykjavik. Meanwhile, Amazon has run a few tests for its take on drone deliveries, and is still moving forwards with them, though it seems to have slowed its progress in the last couple of years after a flurry of activity in 2016 and 2017. What Kind of Drone Deliveries are Possible? The Australia drone regulatory approval comes with plenty of caveats: Right now, the select homes getting drone deliveries will need a safety briefing before they’re eligible, and the drones will only operate between 7am and 8pm during workdays and between 8am and 8pm on Sundays. The drones also won’t be allowed to fly over “major” roads while they’re out and about. And, needless to say, any drone deliveries will always be fairly small packages. Wing is positioning its delivery service as a fast way to get small essentials. A few grocery items, your favorite coffee order, headache medication, freshly baked bread: They’re all lightweight, quickly used, and something you don’t want to dedicate an entire car trip to. When it comes to a new couch, you’ll still want to wait a few days for a normal delivery. When Will the US See Drone Deliveries? Legal red tape is definitely a US drone vendor’s biggest nightmare. 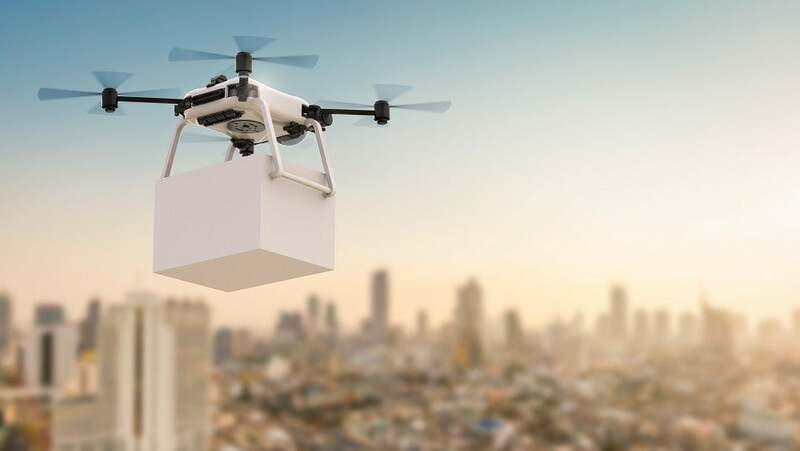 Drone regulations across the US are a bit of a mess, with various laws at the city-wide and state-wide levels conflicting and constricting drone companies from access to their potential customers. It’s possible that a nation-wide ruling could turn the chaos into order when it comes to drones, but we’re definitely years away from that happening. If that happens, the two big contenders will probably be Wing and Amazon’s Prime Air, a conceptual drone-based delivery system still in development. Amazon patented a “beehive-like structure” that could house delivery drones in major cities back in 2016, but Wing is beating them to the punch with an actual test case. Still, the smart money could be on Amazon dominating the drone delivery market, if only because of their massive shadow over the ecommerce industry. Granted, our hopes of getting our cappuccino drone-delivered alongside our morning alarm clock no matter where we are in the world might be a pie-in-the-sky wish. But, assuming the residents of a few select Australian suburbs have a bakery nearby, they’ll soon be getting all the pie they want, directly from the sky.